Dynamics 365 for Customer Engagement uses online synchronization filters to determine which records to synchronize between Customer Engagement and Outlook (using Microsoft Dynamics 365 for Outlook), or Exchange (using server-side synchronization). You can modify the existing online synchronization filters or create new filters to synchronize certain types of records. You can also delete, deactivate, or activate filters. You use the same set of filters (accessed through Dynamics 365 for Outlook) whether you’re synchronizing through Dynamics 365 for Outlook or server-side synchronization. Email is not included in the synchronization filters because email is controlled by when the email is created in Customer Engagement, whether the user is on the recipient list or not. This is true for all email processing methods: Dynamics 365 for Outlook, server-side synchronization, or Email Router. In the web app: In the upper-right corner of the screen, click the Settings button > Options. In Dynamics 365 for Outlook: Click File > Dynamics 365 for Customer Engagement apps > Options. In the Set Personal Options dialog box, click the Synchronize tab. Under Synchronize Dynamics 365 for Customer Engagement items with Outlook or Exchange, click the filters link. 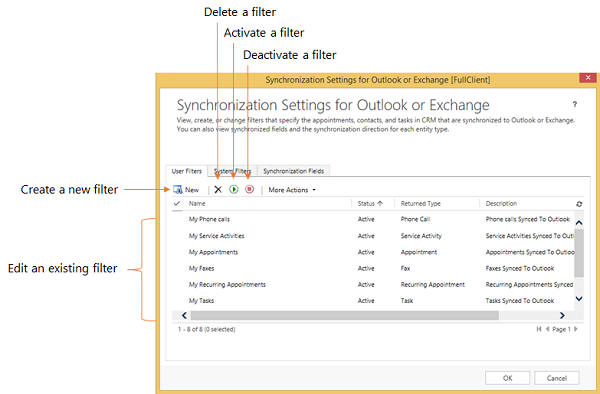 Customer Engagement displays the Synchronization Settings for Outlook or Exchange dialog box with the User Filters tab selected. You can use this tab to create or edit a filter, or to delete, activate, or deactivate a filter. To open an existing filter, click the filter. To create a new filter, click New. You use a criteria row to create or modify criteria in an offline synchronization filter. Each criteria row contains three values: the field to use in the filter (for example, City), an operator (for example, Equals or Contains), and the value to filter on (for example, WA). Point to Select in the criteria grid, and then select the field to filter on from the list. Enter a value to filter on. For each row you want to group, click the down arrow to the left of the field name, and then click Select Row. To remove a row from a group, click the down arrow to the left of the field name, and then click Delete. To clear all rows from the criteria grid, click Clear. Click Group AND or Group OR. After creating a group, you can click the down arrow next to the And or Or to select from different options. You can select a group, ungroup the group, change a Group AND to a Group OR or vice versa, add a clause, or delete a group.